OPJCC provides education, advocacy and action opportunities for our Sisters and Associates as well as the local, state, national and international community of our sisters and brothers. All peace and justice issues are important to us and the following are several examples: abolishment of the death penalty, anti-racism, Earth, human trafficking, migration, peace and nonviolence, poverty and women. The office collaborates with several organizations including: Archdiocese of Cincinnati, Catholic Charities of Southwestern Ohio, Intercommunity Justice and Peace Center, Leadership Conference of Women Religious, Metropolitan Area Religious Coalition of Cincinnati, Mount St Joseph University, Nuns on the Bus Ohio, Sisters of Charity Federation and Vincentian Family of North America. The mission of the Office of Peace, Justice and Care for Creation is to move the work of justice through education, advocacy and action rooted in our Sisters of Charity charism which calls us to be agents of change. 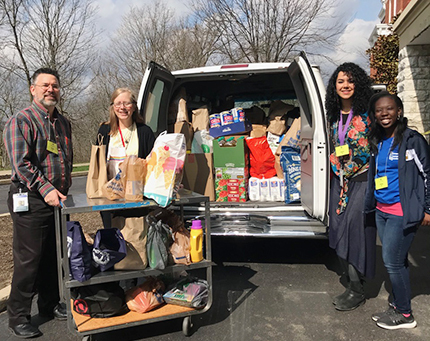 Donated food and personal care supplies during the Sisters of Charity Lenten Collection for our Migrant Neighbors were delivered to Catholic Charities this week! The SC Office of Peace, Justice and Care for Creation partnered with Catholic Charities of Southwestern Ohio to provide food assistance to fit our migrant neighbors dietary needs. Pictured are (from left) Scott Stephens - Catholic Charities Southwestern Ohio, Debbie Weber – OPJCC director, Laila Aladimi - Catholic Charities Southwestern Ohio, and Shanyce Matthews – Mt. St. Joseph University student. Thank you to all our supporters for your compassion and generosity. In 1985, Pax Christi USA offered its members a Vow of Nonviolence. It was composed by Eileen Egan and Fr. John Dear. The Vow can be pronounced privately, with a local peace community, as part of a parish liturgy, or any other way that suits you. Many profess the Vow each year as part of their New Year observance. READ MORE.